One of the largest badminton tournaments, BCA Indonesia Open Superseries Premiere 2016 (BIOSP), was held from May 30th to June 5th at Istora Senayan, Jakarta. BCA as the main sponsor, encouraged fans to support their favourite athletes through social media, whether it be Twitter or Instagram, by using the hashtag #EaaForIndonesia in their posts. Every text, photo or video posted with the #EaaForIndonesia hashtag would be captured by Wooz.in’s platform made for the event, called #EaaForIndonesia Social Wall, displaying the social media content on the big screen at a booth in the event arena. The Twitter and Instagram posts captured would automatically ‘enter’ a shuttecock-shaped ‘container’, filling it until the shape is full. 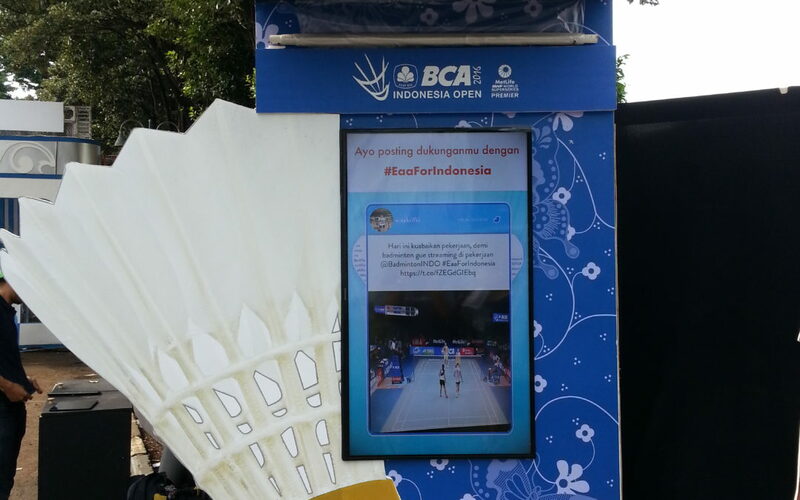 Once full, a siren would automatically turn on, and at that moment “Si Dio”, the mascot for BCA Indonesia Open 2016, would emerge to give out gifts for fans who happened to be near the Social Wall’s location.